The Socialist Federal Republic of Yugoslavia (SFRY) existed throughout the Cold War, before succumbing to internal fractions and secessions. While not a Warsaw Pact member state, being a founding member of the Non-aligned Movement, the SFRY did rely on the USSR for the majority of its air defense weaponry. Strategic SAM defenses were no exception, but a lack of serious cooperation with the Soviets may ultimately have led to the creation of a less capable air defense network. The first strategic SAM deployed in the SFRY was the S-75 (SA-2 GUIDELINE). Two air defense missile regiments (ADMRs), the 250th and 155th, were formed in 1962 and 1965 respectively. Each regiment defended the airspace around a key city, Belgrade for the 250th and Zagreb for the 155th, and consisted of four S-75 batteries. Heading into the 1970s the SFRY could count on a total of eight S-75 batteries for strategic air defense. The 250th ADMR was equipped with the SA-75 Dvina. 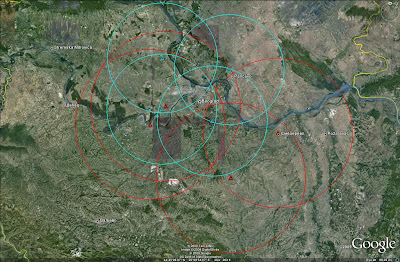 The missile system had a range of approximately 34 kilometers. 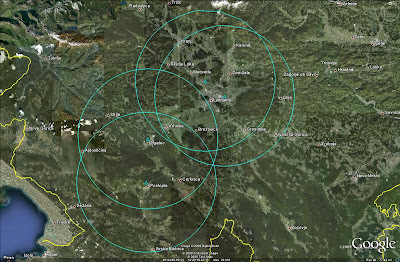 The 250th ADMR's four sites were deployed in a roughly semicircular pattern south of Belgrade. The 155th ADMR, being established three years later, was equipped with a more capable, longer-range S-75 variant, the S-75M Volkhov. This system had an effective range of approximately 43 kilometers. Both systems were constrained, however, by their single-target engagement capability and simple command guidance methodology. In the mid-1960's, however, they were state of the art. The 155th ADMR's four batteries were arranged in a rectangular pattern, with Zagreb aligned along the right "side". The following image depicts the layout and coverage zones of SFRY strategic SAM assets, circa 1970. 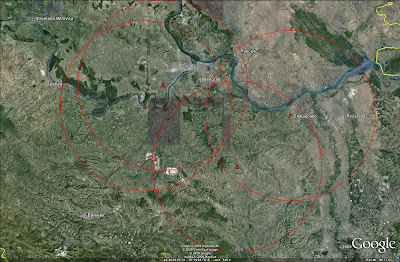 Note the larger engagement zones of the S-75M batteries. In the 1970s, a new weapon system was added to the SFRY's strategic air defense network: the S-125M Neva-M (SA-3 GOA). The S-125M was a command-guided SAM system with a range of 25 kilometers. Like the S-75, it possessed a single-target engagement capability. It did enjoy better low-altitude capability than the S-75 variants, however, and was initially conveived in part to augment the S-75 for this very reason. The SFRY, however, initially chose to deploy the S-125M in a similar manner to the S-75: four-battery ADMRs would be established around important cities. Two ADMRs were established to operate the S-125M, the 350th and 450th. The 350th ADMR was established in 1974 around Ljubljana in the northwest, with the 450th ADMR following in 1977 around Skopje in the south. The 155th and 250th ADMRs retained their earlier S-75 variants, the SFRY choosing, initially, to deploy the S-125s in undefended regions. In 1978, a further four S-125M batteries were assigned to the 250th ADMR, which was redesignated the 250th air defense missile brigade (ADMB) to reflect its increased strength. 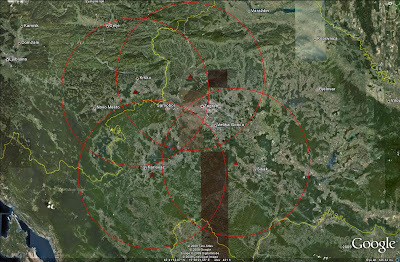 These S-125M batteries were deployed around Belgrade and provided an increased coverage area as well as overlapping coverage zones with extant SA-75 batteries. Being a non-aligned nation, neither part of NATO nor the Warsaw Pact, the SFRY was not committed to the air defense networks of either bloc. The SFRY was also a nation which contained a significant amount of varied terrain. These factors helped shape the general layout of strategic SAM deployments. Given that the SFRY was not permanently joined to one side of the Iron Curtain, its strategic SAM network allows for interesting comparisons to be made between "aligned" and "neutral" nations. Unlike the DDR, for example, the SFRY's strategic SAM network was relatively sparse, designed only to defend key areas rather than provide true nationwide or border area air defense. 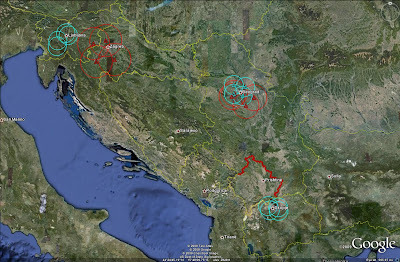 Nationwide or border deployment strategies would have been hampered by the aforementioned terrain constraints, particularly in the areas of present-day Bosnia Herzegovina, Kosovo, Macedonia, and Montenegro. Non-Warsaw Pact member status may have also prevented the SFRY from obtaining long-range systems such as the S-200 (SA-5 GAMMON), or hosting similarly-equipped Soviet units. Alternatively, as a non-aligned nation, the SFRY may have seen the deployment of such a network or the purchase of more advanced assets as unnecessary. Ultimately, the SFRY's strategic SAM network was fairly porous, and in later years suffered from reliance on 1960s-era technological assets. While the network fulfilled the requirement for air defense of key locations, it would not have provided a significant impediment to a modern, equipped air force, especially during the 1980s when the effectiveness of the S-75 and S-125 had been reduced to a significant degree by Western electronic warfare systems and system exploitation. In the 1990s the SFRY began its gradual disintegration into the various nation-states and autonomous provinces which exist today. As the nation degraded, so did the air defense network once emplaced to defend it. The 155th and 350th ADMRs were relocated to Bosnia in 1992, with the S-125M batteries being used to replace the SA-75 batteries in the 250th ADMR. The 155th ADMR was deactivated in accordance with the 1995 Dayton Accords, leaving the S-125M the only remaining strategic SAM asset operational in any former Yugoslavian state. 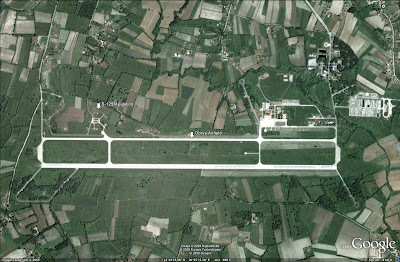 At some point between 1990 and 1999, the 450th ADMR was relocated to Bosnia and emplaced near Kraljevo. Only one prepared site has been located in the area, seen in the image below, suggesting that the remaining batteries may have been kept in reserve and subsequently field deployed during the 1999 conflict with NATO. Due to reliance on largely outdated systems and operating only twelve S-125M batteries, it is no suprise that the 250th ADMB and 450th ADMR failed to achieve great success in repelling NATO air attacks in 1995 and 1999. Many of the same nations, flying the same warplanes, had enjoyed great success over Iraq in 1991, which operated significantly more S-75 and S-125 batteries. The only NATO warplane shot down in 1995 was a French Mirage 2000, and this was downed not by an S-125M but by a shoulder-fired SAM system. 1999 saw marginally more success statistically, likely related to the increased number of sorties which were mounted by NATO. The 250th ADMB would reach the end of the 1999 conflict with a significant victory for any air defense unit, regardless of strength or sophistication: the shootdown of an F-117A. On the 27th of March, 1999, an F-117A was shot down by an S-125M unit commanded by Colonel Zoltan Dani. Col. Dani has stated that the missile system was modified, although he has not provided any details which could compromise such systems still in service in Serbia, and has discussed communications intercepts which provided insights into flight routes. 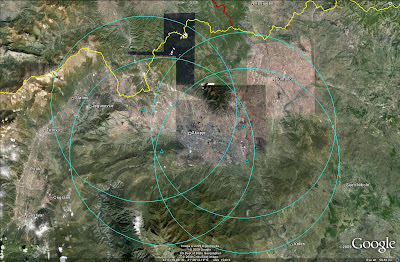 The most likely explanation is that a long wavelength radar system was incorporated allowing the F-117A to be tracked at greater-than-normal range for the system, allowing ingress and egress routes to be studied. An S-125M battery deployed underneath a known ingress/egress corridor would have an excellent chance of tracking an F-117A, as the aircraft is not, after all, invisible. By masking such a deployment from NATO reconnaissance assets, the S-125M battery would be able to engage and shoot down an F-117A. Given that there were no other LO aircraft shot down, despite persistent propaganda claims of B-2 shootdowns to the contrary, this would appear to be a credible scenario, as the likely NATO response of altering future flight routings would alleviate the possibility of a SAM battery being purposely deployed underneath a known route. Again, while Serbian air defense units did not ultimately prevent NATO aircraft from conducting their bombing raids, and therefore failed to achieve their strategic purpose, on a single night in 1999 the 250th ADMB demonstrated to the world that with proper support, competent tactics, and effective training, a less technologically advanced system can still be an effective part of a strategic air defense network. As a side note, the F-117A shootdown likely resulted in the second most famous event of the 1999 conflict-the bombing of the Chinese embassy on 7 May. While various sources have claimed that the building was bombed due to signals intelligence information, alleging that China was studying cruise missile systems to develop effective countermeasures, this story makes as much sense as the official response that the site was hit due to an error caused by outdated maps. By 1999 China was well into developing the HQ-9, and had imported various iterations of the S-300P (SA-10 GRUMBLE/SA-20 GARGOYLE) and Tor (SA-15 GAUNTLET) SAM systems, providing viable cruise missile defense. It is more likely that the site was deliberately bombed to prevent the transfer of F-117A airframe and RAM components to the Chinese. The SFRY did not take an consistently belligerent stance on one side of the Iron Curtain or the other, and as a result was not ultimately under a constant and serious threat from either NATO or the Warsaw Pact. Given the political considerations, it is not suprising that a more robust and capable strategic SAM network failed to materialize. The SFRY simply deployed what it felt was necessary to achieve its goals, and the failings of the network's remnants in the 1990s were simply a result of oversaturation and undermodernization of the remaining weapon systems themselves. Feel free to discuss the content of this article at the IMINT & Analysis Forum in the discussion thread found here. Special thanks to IMINT & Analysis forum member Hpasp for providing SFRY order of battle information and historical data. Really looking forward to a detailed analyses of Armenia's air defense system. Its capabilities in Karabagh against Azeri aircraft and also overall capabilities as robust system and also threats from Turkey. That was great stuff.. I am grateful to you for this great content. Thanks for the read.